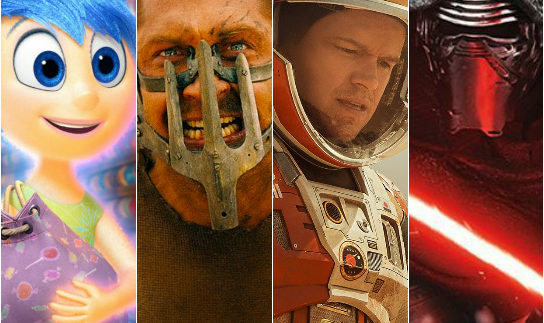 2015 was the year of remakes, reboots and sequels, with the likes of Jurassic World, Terminator: Genysis and Furious 7 numbering among some of the most anticipated and talked-about films of the year. But there are some movies which, apart from sparking mad rushes to cinemas, definitely stood out with their cast, cinematography and direction. Subsequently, witling down the year’s releases to a top ten was no easy task – and in fact caused riot in the Cairo 360 offices as we deliberated which films deserve to be on this list – but it has certainly been a prolific year for film as industry and as art. A slow-burning sci-fi thriller which made us all question artificial intelligence and humanity to an intelligent and dramatic backdrop, Ex Machina boasts an outstanding cast and underlying tones that are both intriguing and chilling. 2015 saw the sequels of two of the most famous spies in the history of film, James Bond and Ethan Hunt, with Mission Impossible bringing a new edge and presenting the best sequel in the series by far, not to mention, another smooth and sleek production for the 007 in Spectre. A comic book character who was virtually unknown to casual and mainstream audiences, the success of the Paul Rudd-starring film was a surprise to everyone. Charming and full of comedy, Ant-Man’s biggest key to its triumph is that it doesn’t take itself all that seriously. Before its release, Bridge of Spies had film fans rubbing their hands in anticipation at the prospect of another collaboration between Steven Spielberg and Tom Hanks, the latter of whom delivers an Oscar-worthy performance in this breathtaking cold war espionage film. A James Bond-esque film with a fresh approach to appeal to a younger audience, Kingsman: The Secret Service was a surprise in all aspects. With great comedy, amazing action sequences and a hilarious villain played by Samuel L. Jackson, Kingsman is highly entertaining. With a slow-paced plot built on the war on drugs and the struggle of establishing law and order, Sicario is one the best and most engaging films of the year. Delivering great wide shots and tension filled scenes along with a fantastic performance by Emily Blunt and one of Benicio Del Toro’s most interesting characters to date, Sicario should be in the running at the Oscars. Pixar knocked it out of the park with a great – and brilliantly abstract – film that we can all relate to. Inside Out is a film full of emotions, simplified and broadened in a very unique way. You will laugh, cry and, most of all, enjoy one of Pixar’s finest animations to date. A direct sequel to 1985’s Mad Max: Beyond the Thunderdome, with Tom Hardy in the titular role, this is a film that blew us away. Mad Max: Fury Road is gritty and dark Charlize Theron performance arguably stealing what is a spectacular show. A great adaptation of a great book, The Martian was the latest in a new breed of sci-fi film, starring the always reliable Matt Damon surviving on Mars alone. With the world trying to bring him home, you can’t help but cheer him on to overcome one obstacle after another – an Oscar beckons. The latest – and possibly most anticipated – entry in the Star Wars franchise revived the series not only for old fans, but introduced it to new audiences in spectacular fashion. With great performances by all the cast members, Star Wars: The Force Awakens is the must-see of the year. Introducing new heroes –Rey and Finn— new villains – Kylo Ren— and bringing back the original cast from the original trilogy was a welcome sight. Check out more of this year's film reviews on the Cairo 360 film section.